Memorial Day is upon us. Here are some ideas for bringing it to the classroom to remind students that it’s more than a three-day weekend and the unofficial start of summer! Check out the Veteran’s History Project, where students can search the collection and learn about a veteran (or two or three . . . or ?). After reading through different stories (each account has different resources — some audio, some copies of letters, official documents), students could creatively share/present their veteran and why that person’s service is important or they could write a poem or story based on one veteran or multiple veterans based on what they learned about them, their service, etc . . .. This is a great way to incorporate the standards for using text as evidence, gathering information from sources, writing, etc . . . You could even work with students to develop a question (yay inquiry!) about war or service or the importance of Memorial Day and let them use this source to help them answer that question. They can search by war or by branch of service so you (or they) could narrow/expand this as broadly as you want. If you’re World Literature, it might be interesting to look into Vietnam or Afghanistan. Brit Literature folks should find plenty in World War I and II that they could perhaps connect to. If you’re an American Literature teacher, you can tie this idea to the American Civil War, but check out Civil War Soldiers’ Stories instead. After choosing a monument to research or read about, students could share what they learned with the class. You could look at one or two memorials as a class and engage in a Socratic Seminar (see possible questions above) in which the memorials become the “text” that students reference in discussion. And if none of these ideas are moving you and you still want to do something, check out Teaching History’s list of Teaching Memorial Day resources. Have an idea to share? Shoot it to me in an email or leave it below in the comments! I had the pleasure of meeting Yusef Komunyakaa, who was a gracious and incredibly sweet man. this way–the stone lets me go. half-expecting to find my own in letters like smoke. but when she walks away the names stay on the wall. In addition, I met Nicky Finney, a 2011 National Book Award Winner in Poetry. Day 13, errrr 15 . . . Thirteen Ways of Looking . . .
For day 15 (it was supposed to be for the 13th day, but that fell on the weekend!) 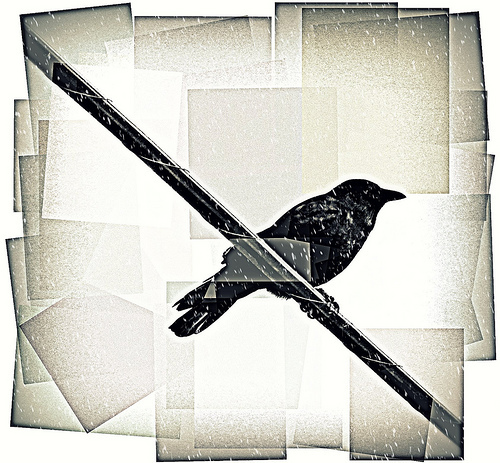 of National Poetry Month, “Thirteen Ways of Looking at a Blackbird” seemed (al)most appropriate. I’ve always loved this poem and the possibility it has with writing workshop/student imitation. After reading, students could write their own, “Thirteen ways of looking at . . . “. They could be great for Writer’s Tea! *For lesson plans on Wallace Stevens, click here. * Show some spoken word poetry and invite students to write their own. We can also use many of the tips we got from Phil Kaye & Sarah Kay in March. Bonnie did this and her kids wrote some great stuff! Like Bonnie’s students, yours could even use the model of “When Love Arrives” to compose a spoken word piece together (as Phil & Sarah did). Shane Koyczan, Phil Kaye, Sarah Kay, and Daniel Beatty (especially “Knock Knock”) are among my favorite poets . . . and all available on youtube. There was also a list on the back of our materials from Phil & Sarah. * Have students create a series of model poems from mentor texts. One year, Dottie Deich did this with great success with Allen Ginsberg’s “Supermarket in California” (link includes an audio reading by Ginsberg) Another fun idea to steal, is Wallace Stevens’s Thirteen Ways of Looking at a Blackbird . . . thirteen ways of looking at anything (each way in a small stanza). I love the possibilities here! Another good model poem/mentor text for American Literature would be Whitman’s “I Hear America Singing” and Langston Hughes’s “I, too, Sing America.” Students could write a modern version using one of the two titles. Here’s a document-link to both: I hear America Singing 1. * Invite students to write a short expository piece based off of a great mentor text. Mentor texts could include Leonard Pitts (I’m a big fan of “Cruel As It Is“) or any of the texts from the This I Believe series (for even more, check out this link – click the “explore” tab). You can engage in an annotation & discussion of the structure/language /”moves” of the piece and then invite students to use writing workshop to write their own. * Use what’s already in the Writer’s Notebook as fodder for something new. Refine narratives written earlier in the year or have students take an idea started and develop a new work/poem/story etc . . . based on it. * Skim through the National Poetry Month postings to see if any post, poem, or idea moves you. Check back each day for a new addition. Please consider leaving ideas in the comments or emailing/sharing them with other teachers. We have our best resources among us!